Ukrainians went to the center of the capital with posters depicting the eyes of their relatives, who remain captives of the Kremlin. In Kyiv, relatives of persons, illegally detained by Russia, held rally at the intersection of the streets of Bankova and Institutskaya, the QHA correspondent reports from the scene. The participants of the rally decided to remind the leaders of the European Union who will come to the capital for the Ukraine-European Union summit, about the humanitarian component of the Russian aggression against Ukraine, about their relatives who are being held captive in the territory of Donbas that is not controlled by Ukraine, as well as in the occupied Crimea and Russia. The participants of the rally brought along posters, depicting the eyes of hostages and political prisoners - their relatives. They hope that the eyes of people who can influence the liberation of Ukrainians will meet with the eyes of the Kremlin's hostages. 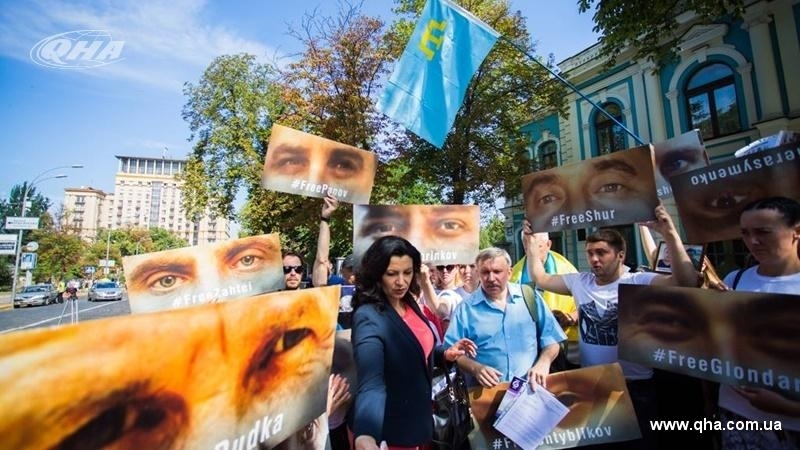 Relatives of the prisoners wrote an appeal to European Commission President Jean-Claude Juncker and European Council President Donald Tusk who intend to arrive in Ukraine on July 13 to attend the 19th Ukraine-EU summit. Vice-Prime Minister for European and Euro-Atlantic Integration of Ukraine Ivanna Klimpush-Tsintsadze came out to the relatives of prisoners of war and the Kremlin prisoners, and promised to convey their appeal to EU representatives. It should be noted that as of April 2017, 121 Ukrainians are illegally held captive by militants in the Donbas, and more than 40 people are registered as political prisoners of the Kremlin.